Compared are the uncut Theatrical Version (released by XT Video) and the US-TV Version (aired on AMC). This TV-Version contains more than 20 minutes of alternate or new scenes, further scenes have been removed from the Theatrical Version. By now, only the Theatrical Version can be watched on US-TV because there's no DVD master for the TV-Version. Unfortunately, the image of the TV-Version is cropped (Original aspect ratio 2.35:1, the TV Version is fullframe). Easy to recognize and some scenes are cuts very badly. All gore scenes are censored so that there isn't much of it left. The comparison has been made with a recording from AMC when the TV-Version aired one of the last times before the master has been replaced by a DVD master with the Theatrical Version. All in all, there are 56 cuts / alternate scenes / extended scenes. The TV-Version is 313.7 Sec longer than the Theatrical Version. The remaining difference of 12.7 seconds result from dreadfully edited commercials, rounded numbers and the different pace of either of the versions. The time index refers to the TV-Version. 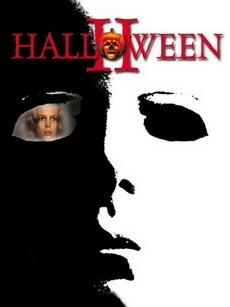 The TV Version starts with an intro while the Theatrical Version begins with a recap of the first Halloween movie. The font is different plus the TV Version here contains the scene the Theatrical Version begins with. When the neighbor comes out to figure out what was going on, Loomis explains to him that he'd shot Michael but he had escaped. He tells the neighbor to call the cops. Now, the TV Version lacks the scene with the neighbor telling Loomis that he (the neighbor) got scared to death while Loomis is looking at his bloody hand. Then Loomis comes up with his famous "You don't know what death is" line. Instead, Loomis just leaves after being asked "Is that a Halloween-joke?!" by the neighbor. Dreadful cut because the beginning of the intro is still audible. Now the above-mentioned intro in the Theatrical Version. Michael is straying. When he notices some kids running around on the street, he turns away and ends up in front of a dog barking at him. When he keeps walking, he sees Loomis wandering on the street which is why he quickly hides behind a house. The cops arrive at Loomis' position who explains to them he'd shot at and hit Michael six times but he'd just gotten up and kept walking. The cops don't believe him and ask him to get in the squad car. Michael keeps walking. Then he trespasses and stops in front of a window. The old lady asks his husband what he wanted to have on his sandwich. When the husband doesn't respond because he's fallen asleep in front of the TV, she enters the living room and George A. Romero's "Night of the Living Dead" is on. Michael goes to the backdoor and opens it. He enters the kitchen where he notices a huge knife. He takes it in his blood-smeared hands. The Romero movie on TV gets interrupte by a breaking news. Several adolescents from Haddonfield became victims of a brutal mass murderer. Some shots of Michael standing behind the old lady and leaving through the kitchen are in between. The Romero movie continues: "They're coming to get you Barbara!". The old lady walks backwards to the kitchen where she touches the blood drops left by Michael with her fingertips As soon as she realizes, she looks at her hands and starts screaming. Michael keeps walking around outside. A young girl (Alice) steps outside and asks if everything was alright. When there's no response, she goes back in her house. Michael goes to the window and watches her on the phone. She explains to her friend that her parents weren't home. At some point, her friend asks if she'd already heard about the murders. Alice looks scared and turns on the radio. One can see Michael entering the house behind her. Alice talks to her friend about the incidents and gets startled by some weird noise. The friend on the phone keeps calling Alice's name but Alice looks to the living room. She seems to be very scared. Then she asks "Who is it?". Intercut to the living room and the open door. Alice asks "Who is it?" one more time. She's scared when she enters the living room. All of a sudden, Michael jumps her, grabs her and stabs the knife in her neck. Blood splatters. Not until then, the TV Version is back in the saddle. The sound of Alice getting killed is still audible though. The TV Version lacks the scene of Gary and his mom walking into the hospital. But later on, one can see them standing at the reception counter. In the TV Version, Bud and Jimmy are staring at Laurie while she's being treated by Dr. Mixter and his assistents. Shot of Dr. Mixter and the assistents from Laurie's POV while the image slowly blurs. They put Laurie down and open her shirt. Bud and Jimmy keep watching which is why Mrs. Alves closes the curtain. The TV Version lacks Ben Tramer getting hit by the squad car. The TV Version doesn't continue until the squad crashes into the van whereupon the van explodes. The dialog has been slightly altered when Brackett asks Dr. Loomis "Is it him or not?" and Dr. Loomis replies "I don't know!". Furthermore, music has been added. In the Theatrical Version, he doesn't say a single word. He's just standing there instead. The cop turns around to the burning body. Now the scene from the beginning. Due to continuity reasons, the scene with Dr. Loomis walking on the street and getting in the squad car is missing here. Instead another shot of the barking dog. Moreover, one can't see Michael reaching for the knife. He's entering the kitchen instead. The scene has been edited differently as well. One doesn't see the woman touching the blood but a close-up of Michael instead. (It kind of looks like Mrs. Elrod was screaming because she noticed Michael and not because of the blood on her hand.) The TV Version continues when the woman is already screaming. Alice's murder is missing anyway. Fade to black when Michael vanishes in front of Alice's window. But it's quite obvious the scene doesn't actually belong there because the ending of the intro is still audible. Another removed scene for continuity reasons in the TV Version when Gary leaves the hospital with his mom. Furthermore, Bud, Mr. Garret and a nurse are watching the news on TV plus an image of Janet walking across the hallway in the mirror. The shot of Mrs. Alves walking around the corner is also in the TV-Version. Now the scene of Janet in the mirror but only her last steps. The camera pans to Gary on the right. He's asking about Laurie and Janet replies she'd broken some bones. The scene continues with Dr. Mixter sitting in Laurie's room. He says to her: "Things went rather well. There might be some scarring." Then Jill enters and says: "Did you hear? 3 more people!" Mrs. Alves asks Janet to call Laurie's parents. Subsequently, Mixter tells Mrs. Alves Laurie's parents were on a party. The three of them leave the room. The Theatrical Version continues when Jimmy enters the room. When Annie's dad covers his daughter's body, music has been added. On the other hand, the TV-Version lacks the shot of Annie staring at the viewer. The TV-Version doesn't start until the dad has his hands near her eyes. Now the scene with Gary and his mom leaving the hospital. The scene with the three of them watching the news has been added here as well. But due to the different aspect ratio, Mr. Garret sitting on his chair is not an issue here. The news scene is longer. Extended shot of Bud and Jill standing at the desk whereupon Jill sprays something in her mouth several times. Then she looks at her watch before she leaves. After that, the Theatrical Version continues. After the shot of Michael in Karen's side mirror, the Theatrical Version continues with a shot of Bud, Janet and Jimmy watching the news. Furthermore, the exterior shot of the hospital and the empty entrance area is missing, too. When Karen walks in, she apologizes to what Mr. Garrett responds with "Teenage punks on drugs". The news on the radio are also audible. Now the shot of the empty hallway. Bud's dialog with Janet is slighty different. After Karen came in, Bud sings another version of "Amazing Grace". For instance, he sings "I tell no lie" instead of "I need your pie". Some more words have been changed. Michael is watching Karen. Jimmy arrives. They start talking about the murders and Jimmy says for fun he wished Mrs. Alves was going to get killed as well. After a short while, Michael turns around and walks down the hallway to the exit. Jimmy steps back from Karen. The Theatrical Version restarts with Jimmy walking away from Karen. Intercut to Karen watching Jimmy leave before the door gets closed. After Michael went down the stairs, a shot of Mrs. Alves follows. She's with Janet at the front desk, they're trying to reach Laurie's parents. Janet is chewing her fingernails. Mrs. Alves blames Janet for not having called her parents asap. Jimmy tries to get to Laurie, so he's sneaking up from behind. He signals to Janet, who has already noticed him, to cover him - literally - so that Mrs. Alves can't see him. But she simplay says "I heard that!...Two minutes!" Extended shot of Michael sneaking around Mrs. Alves in the TV Version, due to the different aspect ratio. He leaves the background sooner in the Theatrical Version. Jimmy enters Laurie's room and brings her the earlier-promised coke. He asks about her broken arm and says Myers could have been a little more careful. Then the Theatrical Version continues. Mr. Garrett tries the radio and says to Janet: "Gotta check the telephone blocks in the store room." When Mr. Garrett checks the trash can, the Theatrical Version has something with blood on it in it while Mr. Garett is being jumped by the cat instantly in the TV-Version. The scene with Michael chasing Garrett contains new footage as well. Janet also hears parts of Mr. Garrett's conversation in the TV-Version. The murder of Mr. Garrett is cut, too. Michael lifts his arms, then cut to Janet immediately. In the Theatrical Version, a close-up of the hammer follows. Then Michael crushes Mr. Garrett's skull. Jill is on the phone while Jimmy enters Laurie's room one more time. Jill says to Jimmy: "You're going to get us in trouble!". Jimmy walks in and turns on the light. He tells Laurie Michael Myers was dead whereupon she becomes hysterical and screams: "He's not dead!....He won't die". Jimmy calls for the nurse to calm Laurie down. While Dr. Mixter is giving Laurie a shot, the power goes off. After the wrong Michael got IDd as phony, Loomis and Hunt leave the room. He asks him to support the search for Michael to stop him for good. Then Hunt asks Loomis if he had any idea where Michael could be at the moment. Loomis says: "If he was wounded, he might try to go home." Karen and Janet about idle break-in in the store room. Karen pretends everything was alright. But Janet gets angry and tells Karen about Laurie screaming that Michael Myers was coming to get her. Then Janet says to Karen: "Well, I just think its creepy." The Bud and Karen dialog is longer. He talks her into going to the therapy room with him for an extended period. Now the TV-Version lacks Laurie lying in her room, dreaming about meeting young Michael Myers when she was a kid herself. Being well-dressed, Karen enters the therapy room. She walks to Bud who's already in the tub. Bud demands to join him. She goes to another room to get undressed. Now, the Theatrical Version continues as well. Myers only dips Karen in boiling water once. As a result, it kind of looks like she drowned. In the Theatrical Version, he dips her in the boiling water five times. Her face gets more and more scalded until she finally drops dead to the ground. Shot of a squad car in front of the old school. Now the scene with Marion and Loomis in the back of the squad car. Loomis gets to know that Laurie is Michael's sister. Some music has been added to the scene as well. This scene is later in the Theatrical Version but in seperate parts. That's why the time of that scene hasn't been added to the calculation. Exterior shot of the Haddonfield Memorial Hospital, then Michael walking across the hallway. In the Theatrical Version, it can only be watched on a TV screen which is why only the exterior shot has been added to the calculation. When Jimmy realizes that Laurie was in a coma, he says to Janet: "I'll get the doctor". In the Theatrical Version, he says "I'll go get Dr. Mixter.". Jill desperately tries to treat Laurie. When the treatment doesn't work, Jimmy runs out of the room to find Mrs. Alves. After this scene, the Theatrical Version continues with a scene after Jill Laurie shined light in her eyes. This scene is entirely missing in the TV-Version. Here, the TV-Version lacks the entire death of Janet and Dr. Mixter. After Laurie fell in a coma, the Theatrical Version continues with Janet on her way to Dr. Mixter. After searching him for a while, she finally finds him with an injection in the eye. She walks backwards and falls in Michael's arms while doing so. Then a close-up of him ramming her an injection filled with nothing but air in the temple. Janet drops dead on the ground and Michael watches it. Now Laurie's dream sequence. (Makes more sense at this point because now it's common knowlegde that she's Michael's sister.) But the sequence has been alightly altered here. Laurie says to Michael: " Michael, please don't hurt me......I'm your sister"
The TV-Version lacks Michael with the knife in the hand. Instead, he walks straight up to the blanket and removes it. In the Theatrical Version, he stabs into the blanket three times. Several shot of Michael in Laurie's room. He takes her pillow and, filled with anger, he tosses it in the corner. Then he turns around and leaves the room. After Laurie limped across the hallway, the Theatrical Version continues with Michael leaving her room. In the TV-Version, which contains that scene at an earlier point, Myers now shuts the door. After the shot of Laurie on the surveillance cams, the TV-Version cuts to very same situation. The shot of the surveillance cams in the Theatrical Version is shorter than the shot of Laurie in the hallway from the TV-Version. After she got the phone from the dresser, Laurie slips in the Theatrical Version after the movie cut back to Myers in the hallway. In the TV-Version, she's immediately sitting at the wall after the shot of Michael. In the TV-Version, Laurie calls her mom and stumbles in the phone: "Mama...Mama...Mama...he won't...Mama...he won't die Mama...he won't go away Mama". Then she hangs up because Michael is interrupting her. In the Theatrical Version, she picks up the phone and hangs up immediately. Now the scene with Loomis, Marion and the cop leaving the school and getting in the car in the Theatrical Version. But the conversation in the back of the car is still being held back. Jimmy's conversation with Jill is longer. Jimmy: " We've got to find Laurie." Jill: "We've got to find somebody. Think maybe someone's got in?" Jimmy: "What do you mean?" Jimmy searches for Laurie elsewhere. In the Theatrical Version, he finds Mrs. Alves' dead body and slips on the blood trail. In the TV-Version, he never finds her body. When Jill gets killed, the Theatrical Version contains a close-up of Myers' hand raising Jill with the scalpel. The TV-Version doesn't have that scene, it contains a shot of her terrified face instead. Jill lowering her head is missing. After Laurie ran off from the hospital, a shot of Loomis and Marion in the car follows. After Laurie took cover in the car, the TV-Version continues with a further shot of the hospital and Laurie hiding out in the car in fear. This scene is also in the Theatrical Version but later. Now the Theatrical Version goes on with the car conversation. The car passing by the sign to the hospital is equal in either of the versions. Then the shot of Laurie's car which has already been used slightly earlier in the TV-Version. For continuity reasons, the TV-Version lacks Jimmy getting in Laurie's car where his head hits the horn. After Laurie straightened him up again, his head drops back. Bottom line, he doesn't survive in the Theatrical Version. The TV-Version doesn't continue until Laurie falls out of the car. The cop gets killed in a different way. In the Theatrical Version, his throat is slit while he's being jumped killed from behind by Michael Myers in the TV-Version. How he exactly dies is hard to tell because the quality of the recording (it was on old VHS) is pretty lousy. While Michael is waving around the scalpel in the operating room, a further scene of Jimmy looking for Laurie has been added here. After Laurie gets tossed around by the explosion, the scene with Jimmy slipping follows. But he doesn't look at Mrs. Alves. It seems he slipped by the power of the explosion. When Laurie is in the ambulance, a further white blanket suddenly pops up behind her. She turns around and sees Jimmy. She starts to cry and says: "We made it!....We made it!". She takes Jimmy's hand and "Mr. Sandman" rings in the ending.